This is How You Make Your Baby Love Fruits! Spring reminds us of the beauty of a freshly blooming flower, seeing butterfly’s starting to appear, new green buds on trees. Everything is alive again! Last week, we received so many positive vibes from our fans, asking to continue with #FoodArt ideas that encourage kids to love fruits. So we decided to start one of our favorite seasons of the year with this whimsical and easy plate, inspired butterfly design. The very own first step, is to have a clear vision of what you want to accomplish. Seeing that, we were truly inspired by the color palette of our clip: Yellow, pink, red, white, among other shades. Due to the great design of the clip, we thought on mixing and matching it’s elements on a plate. However, always keep in mind that the importance of this step, will have a direct effect on the portions of food you use on it. After designing the composition, it’s time to write down the list of products you may need to buy like: fruits or veggies. In this case we chose delicious and nutritious fruits. Once you have all the layers in order, fruits cut and you feel comfortable with your decision, it’s time to serve. And to make it even more healthy we added a delicious juice of Guava to the meal, which has a high content of Vitamin C and E.
As we mentioned before, it’s food, and you really don’t want to have it served for a long period of time, so be sure, the ingredients are fresh. At the end of the day, it’s just for fun, but your little one’s health is very much important. In early December, I reached out to the 18,000 members of this wedding community and asked, "What are your predictions for 2014 weddings?" Here are the highlights from the answers that I received from the experts (aka BridalTweet's wedding vendors). After reading this list of predictions, I'm sure that you'll agree that 2014 will bring forth elegant, meaningful moments that we will remember forever! 1. Hand-painted Wedding Cakes. Predicted by by Crystalpearl Jewelry. How to throw a Perfect Princess Party! 1. Every princess needs a palace, so first you must decorate the house! You can get pink sparkle tulle rolls and garland the tulle along the walls and tables. Tie big bows on the back of the chairs. Remember, the more girly and frilly the better. Next, place some inflatable unicorns, frogs & butterflies around to give the house the feel of an enchanted palace. Groups of pink and purple balloons add a lot of visual punch and create a party atmosphere. 2. Now you need food and treats! No matter what you choose to serve, little girls especially love the special touches that reflect the princess theme. Sandwiches or other foods can be cut out with princess themed cookie cutters. A really fun idea is to place pink rock candy in little treasure chest shaped favor boxes. Now each princess has her jewels! Lollipops in the shape of roses, flowers, frogs, stars or tiaras will complement your theme as well. Bubble gum shaped coins can be used as treasure in a centerpiece or on a side table. Of course, the cake should be shaped like a palace. Make sure to ask the baker to tint the cake pink on the inside. Another unique touch is to serve pink hot chocolate as a special princess beverage. 3. Another important element for a good princess party is the costumes. Give each girl an inexpensive tiara and wand as a party favor. If you want to go all out, give them each a ribbon tutu, as well. The little girls will have great fun dressing themselves, each other and showing off their princess style. Don’€™t forget to take pictures! 4. Next you need favor bags for the princesses to take home and enjoy. 5. Plan some great age-appropriate activities to entertain your little guests. Children love a simple treasure hunt; hide plastic jewelry around the party room or in the yard. Pin the crown on the princess games are available and are sure to make everyone laugh. Guests could make their own princess wands or crowns using craft store supplies or princess craft kits. Hang a pinata shaped as a castle, dragon or tiara! How cute and fun! 6. Don’t forget there may be a prince or two at this party, so you might want to have a few prince crowns, swords and shields to delight them. You might even want an inflatable dragon for a prince to conquer! The modern wedding has many traditions, but the role of the flower girl is one of the oldest. The flower girl will want to work in coordination with the wedding florist and anyone else creating the overall atmosphere. Her coordination with the florist is due to her role spreading flower petals during the ceremony. She is one of the most recognized members of the marriage processional. The role of flower girls is also traditionally female in all marriage traditions. She is a key member and participant in all modern weddings today. She is part of the traditional family members in the ceremony, along with the page boys and ring bearers. There have always been women and girls walking together as part of the marriage traditions. This is true of almost all marriages from the beginning of time. Nothing is more traditional. Although there are many types of marriage rites and ceremonies today, the role of girls and spreading flower petals has remained almost unchanged. You see flower girls in Christian, Catholic, Hindu, and even Wiccan marriage rites around the world. Modern flower girls are a symbol of rebirth, innocence, family and the newlyweds entering their marriage with purity of heart. Florists are knowledgeable in the best arrangements for modern marriage ceremonies of any religion or style. Florists and marriage planners can help with such details. The duties of a flower girl are simple but important. In the traditional wedding ceremonial format, flower girls walk ahead of the bride for the entrance processional. She generally carries a basket and spreads flower petals over the floor where the bride will be walking. She may alternatively carry a bouquet of flowers. The girl chose for this duty should be a member of either the bride or groom's extended families. She may also be a personal friend or child of the extended family. It really is only important that she be a recognized member and friend of the bride or groom. She traditionally is a younger member of the ceremonial participants, but this is not absolutely necessary. The right flowers to pick for use by a flower girl are best kept traditional. If you work with the assistance of a florist, the choice of flowers should be easy. A professional florist will have arrangements for weddings already in mind, but will work with your personal needs. The florist may recommend any type of flowers for the ceremony, but traditionally rose petals are spread out for the bride to walk upon. These rose petals will usually be a mixture of red, pink, and white petals. This represents love, passion, and purity being invoked for the wedding couple. Modern florists may offer other ideas for marriage ceremonies. It is smart to hire a professional florist for these duties, as they will know the best arrangements to make for beautiful flower arrangements. The wedding attire for a flower girl has not changed much over the years. Sometimes it is helpful to coordinate outfits with the florist for colors, but generally it is more a matter of tradition. The bride and her young leader in the processional wear gowns of white, which is in contrast to the bridesmaids. This is a tradition that seems to be as old as traditional Christian marriage rites. In the past, it was historically traditional for the flower carrier to wear clothing that was made by the family of the bride or groom. Often times, she and the ring bearer were dressed in attire to look like a couple themselves. They were often made to look like miniature versions of the bride and bridegroom, this is why their clothes were provided by the families of the newlyweds. Most modern couples do not follow this tradition, so it is expected that the children leading the procession have their parents pay for their marriage processional attire. This is also true for any other expenses that are relative to her participation in the marriage ceremonies. It is amazing that these traditions have changed so little over the centuries. Perhaps it is because they are symbolic of the most basic and human side of becoming a woman. These rites represent women progressing forward in maturity, but also represent their role in the rites of human history. In modern weddings, the flower girl is an important and time honored symbol. She is key to the traditional wedding ceremony. She is also a symbol of innocence and the new wedding couple entering the world. It is both a symbolic gesture in the marriage ceremonies, but is equally an initiation rite for the young girl. She will one day have someone she appoints to be ahead of her in her own marriage ceremony. She will one day step on rose petals that another young girl will lay before her own feet, as she is led towards the doorway to her own matrimonial ceremony. The marriage rites carry on from generation to generation in this way. Each new woman and girl taking part to learn the path of marriage, but also to take part in it themselves one day. TODAY ONLY!!! Get 10% OFF all birthday items. Prices have already been marked down. If you have a question about sizing or ship times please check out the FAQ or contact us section. Most custom items such as tutu's, personalized shirts take approx. 2 weeks to ship unless Rush Shipping is selected. Looking for the perfect Tutu, dress, or Christmas outfit? Check out our huge selection and get it in time for the Holiday's. Your little angel will look perfect in her new tutu or designer feathered dress. Also, enter coupon code HOLIDAY2013 and save $5.00 off your order!!! Also, know someone who is having a baby? Check out our newborn collection for the hottest styles this season and if you have a question at anytime please text Julie at 561.827.1975 (anytime). Well it's May and Mother's Day will be here soon. I plan on adding some delicious recipes to this article later on tonight. Also, I am in the process of adding many new and exciting products to our store. In addition I am going to be looking for a good cause in which a percentage of sales can be donated to a local charity that helps soldiers or there family's. I am open to any suggestions. All American Baby Boutique would like to wish it's customers and vendors a Happy New Year! This year will bring many changes to our store. We are bringing more items to our online store including christening gowns, toys that are made in the usa, items for expecting moms and dads and a new forum will be set up for new parents to chat. I am very excited! I am also open to advise and suggestions that will help improve our site. When it comes to baby naming, holidays and seasons are are very popular sources of inspiration. Here are some fun and seasonal name ideas for Thanksgiving babies -- inspired by the Pilgrims, the ancient Greeks... and even your very own family. If you want to choose a first name for your baby to celebrate Thanksgiving, you're not alone. In fact, the holidays and seasons are very popular sources of inspiration. There's a virtual cornucopia of fall names out there, if you know where to look. So where to begin? You might want to consider what really were some of this nation's first names: Those of the Pilgrims who celebrated the First Thanksgiving in 1621. "A few of those names -- Joseph, Christopher and Sarah -- are still on our country's top 10 list almost 400 years later," says Nancy J Price, co-founder and editor of Pregnancy & Baby. "Other names from that era are less common now, but they still have a traditional flair." The site's top five Mayflower picks for boys are Bartholomew, Elias, Jasper, Gilbert and Myles. For girls, they recommend Alice, Constance, Eleanor, Priscilla and Susanna. Not every name back then was what parents would consider "typical" by today's standards. For example, three girls on the ship were descriptively named Remember, Desire and Humility. There were also three boys with similarly expressive monikers, including a lad called Resolved, and two brothers named Love and Wrestling. Based on reader feedback, we have learned that many parents like to put last things -- or at least last names -- first. "A few of the Pilgrim surnames are exactly the kind of given names that really appeal to a lot of parents today, especially for boys," says Betsy Gartrell-Judd, co-founder and editor. Our top five choices from the passenger list are Allerton, Chilton, Hopkins, Latham and Tilley. When celebrating this season, the Native Americans thought to be at the First Thanksgiving can't be forgotten. Among them were Massasoit, Quadequina, Squanto, Hobbamock and Tokamahamon. If you want to look beyond our shores, why not consider names that mean "thankful"? For girls, there's Jendayi (Egyptian) and Shakira (African). If baby's a boy, you might think about Jaden (Old English) or Zikomo (African). "Harvest" is also another seasonally relevant term, and the lovely Demetria (which is Demi Moore's real first name) is known as the Greek goddess of harvest. Not quite right? Well, that same goddess is Ceres to the Romans, Mimis to the Turks, and Annona in Latin. Along those same lines, Charmaine is French for "bountiful orchard." Finally, there's Autumn. "It's pretty, it's seasonal, and most people know how to spell it," says Gartrell-Judd. If these names are just not "it" for your little pumpkin, the most perfect name this season may be the sweetest of all. "Just think of someone in your life, past or present, who you're especially grateful for," says Price. "Celebrate Thanksgiving by naming your baby in honor of someone special." Still need help finding the perfect baby name? Check out BabyNameCentral.com or BabyHold.com for more tips and ideas. Pumpkin in Baby Food Recipes - When Can Baby Have Pumpkin? A pumpkin is a type of squash and is a member of the gourd family (Cucurbitacae). This family also includes squash, cucumbers, gherkins, and melons. Pumpkins are actually fruits. We, and many of our visitors, always think of pumpkin as a fruit so we have included it in our Fruits area. Of course, there are also many people who think of pumpkin as a veggie. So how do you think of pumpkin? 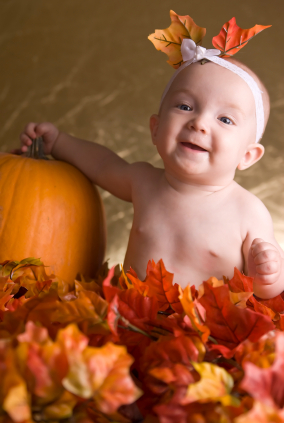 4, Scrape out the pumpkin "meat" and then mash or puree as needed for your baby. Puree or mash as needed for your baby. Pumpkin is very watery so baking is the best method - you may peel, de-seed and steam chunks of you prefer. Mix thoroughly, blend if needed for your baby's texture preferences. Makes a yummy addition to baby's cereal or yogurt. Mash the pear and then mix in the pumpkin – puree if needed. Combine all food (steam pear and peach together if need be and mash or puree if needed. Heat the oil in a medium saucepot then add the onion and squash cubes. Saute until the onions are soft and translucent then add the vegetable stock. You may make this a sweet puree by using nutmeg, ginger and cinnamon as the spices instead of the savory spices and herbs. Toss this mixture with cooked brown rice, couscous, lentils or even quinoa for a hearty meal. drizzle with pure maple syrup or sprinkle slices with brown sugar (if desired) and then sprinkle cinnamon, nutmeg and a pinch of ginger. We like to mix these spices together first for an even mix so that no one spice overpowers the other.